SUPPORT THE ARTS. SAVE THE PLANET. HELP US TURN CLOSETS INTO CONCERTS! Back again and better than before – just a few more feet down Bedford Road, Pleasantville! 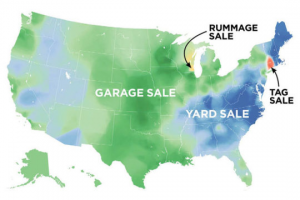 A Giant Tag Sale to benefit the Hudson Chorale will be held on Friday and Saturday, October 5 & 6, 2018, from 9:00 am to 4:00 pm. This is NOT your typical neighborhood tag sale of used toys and children’s clothing. We receive both used and new donated items in a wide variety of categories: used and antique furniture, collectibles, jewelry, appliances, housewares, CD’s, DVD’s, toys, sports equipment, tools, gardening supplies, good used clothing and accessories, bed & bath, decorative art, etc. Check out our new indoor location where we can guarantee a “rain or shine” event and give you better access to our wide range of merchandise. Location: United Methodist Church 70 Bedford Road (Route 117), Pleasantville. To donate tax-deductible items, call (914) 980-5812. Early Bird Friday October 5 from 8–9 am for $10. All proceeds will benefit Hudson Chorale, the area’s largest not-for-profit community chorus, and will be used to cover the costs of securing professional soloists and musicians to join us in our season concerts. Weekly rehearsals are held at the Pleasantville Presbyterian Church, and singers come from throughout Westchester and surrounding counties. The chorus performs a wide range of music featuring both traditional and contemporary composers. See the website for complete concert, membership and audition details. www.HudsonChorale.org.